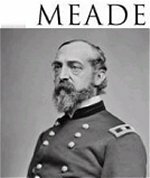 The son of Richard W. Meade and Margaret Coates Meade, George Gordon Meade was born in Cadiz, Spain on December 31, 1815, where his father was serving as an agent for the United States Navy. The family moved to Philadelphia where George Meade attended Mt. Airy School but had to withdraw when his father suffered financial problems. For the next few years, the Meades moved between Baltimore and Washington and George attended several different schools. Though he wanted to attend a regular college, Meade applied for West Point and became a cadet in 1831. Meade did not particularly relish military life though performed well as a student and graduated nineteenth in his class of 1835. Lieutenant Meade was appointed to the 3rd US Artillery and transferred to Florida at the beginning of the Seminole Wars. 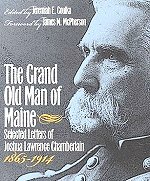 Meade became ill with fever while in Florida and was reassigned to the Watertown Arsenal in Massachusetts for administrative duties. His term at Watertown helped him recover from his feverish bouts, but he was very disillusioned with the army and prospects of a military career. Meade resigned his commission in 1836 and went to work for a railroad company as an engineer to survey territory for new rail lines. In 1840, he found himself in Washington where he met and later married Margaretta Sergeant. Determined to give his new bride a higher standard of living, Meade re-applied for military service in 1842 and was appointed a 2nd lieutenant in the Topographical Engineers. His military assignments took him to Texas in 1845 where he was later assigned to General Winfield Scott's Army during the War with Mexico. After the conflict in Mexico was over, he was moved back to Philadelphia where he continued work on building lighthouses for the Delaware Bay. 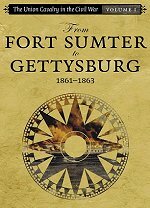 Lieutenant Meade was eventually promoted to captain and for the next ten years spent time in surveying and design work for lighthouses on the east coast, except for a brief assignment with the army in Florida during the 1850's campaign against the Seminole Indians. Soon after, Captain Meade participated in the survey of the Great Lakes and tributaries. 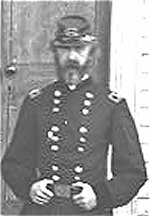 At the outbreak of the Civil War, Captain Meade offered his services to Pennsylvania and was appointed as a brigadier general of volunteers. 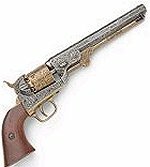 Like many American families during the Civil War, Meade's was also touched personally by sectional strife. His wife's sister was married to Governor Wise of Virginia who later became a brigadier general in the Confederate army. Meade was assigned to command a brigade of Pennsylvania volunteers and it was during this time that he began a friendship with John Reynolds who was from Lancaster, Pennsylvania. General Meade and his Pennsylvanians built fortifications near Tenallytown, Maryland, which were part of the defenses of Washington. 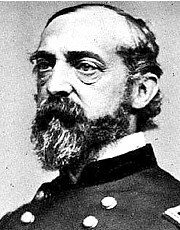 Nicknamed, "The Old Snapping Turtle", Meade gained a reputation for being short-tempered and obstinate with junior officers and superiors alike. He especially disdained civilians and newspapermen. In March 1862, his command was assigned to the Army of the Potomac on the Peninsula, southeast of Richmond. His troops saw hard fighting at the battles of Mechanicsville, Gaines' Mill and at Glendale where he was seriously wounded. 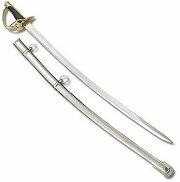 A musket ball struck him above his hip, clipped his liver, and just missed his spine as it passed through his body. Another bullet struck his arm, but the feisty general stuck to his horse and continued to direct his troops. It was only after a heavy loss of blood that he was forced to leave the field. Meade recovered from his wounds in a Philadelphia hospital, but early in September he left the facility to rejoin his troops in the field. The Confederate Army of Northern Virginia had crossed the Potomac River to invade Maryland. Meade was placed in command of a division of the "Pennsylvania Reserves" and led them at the Battle of South Mountain and then at the Battle of Antietam on September 17, 1862. It was at Antietam when Meade took temporary command of the First Corps when the corps commander was wounded. 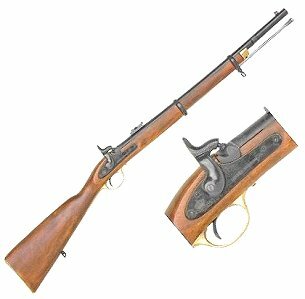 He stayed with the army through the late fall and participated in the Battle of Fredericksburg, Virginia on December 13, 1862. 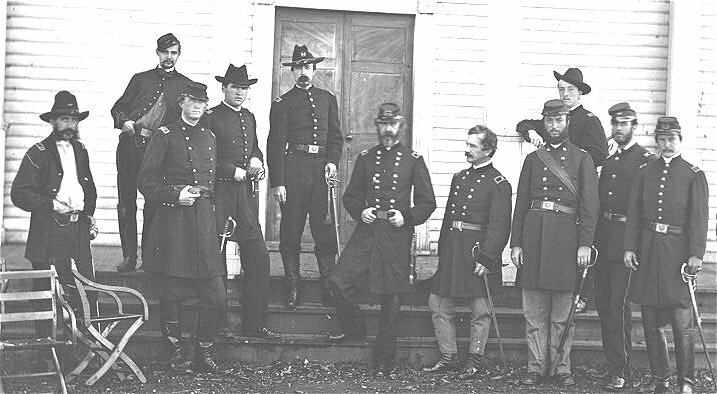 Soon after Fredericksburg, Meade was assigned to command the Fifth Army Corps of the Army of the Potomac. His assignment as a corps commander took him through the trial of the Battle of Chancellorsville in May 1863. Though the army had been soundly defeated there, Meade handled his corps with great skill and protected the important fords on the Rappahannock River. In mid-June, the army moved north and across the Potomac River in pursuit of Lee's Army of Northern Virginia . 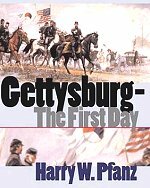 It was while the Army of the Potomac concentrated around Frederick, Maryland that he was given the assignment of army commander on June 28, 1863. Though surprised at his selection for the position, Meade realized that he had close support from many of the army's corps commanders including his old friend John Reynolds who commanded the First Corps. The following day, Meade issued orders to continue the army's pursuit of Lee. 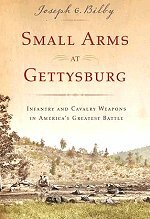 The Battle of Gettysburg occurred just three days after General Meade's appointment to command. 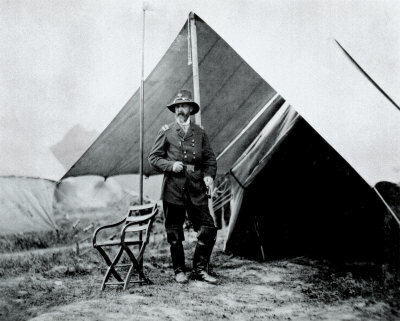 Using the most qualified of his corps commanders to act for him in the field, Meade arrived on the battleground late on July 1st where he learned the details of the death of his friend and mentor Reynolds. He decided to fight a defensive battle on the ground then held by the army south of the town. The following day saw some of the bloodiest fighting of the war as Lee's army attacked both flanks of Meade's line, but determined Union veterans threw Lee's equally determined back. 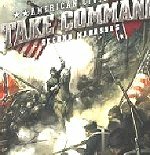 That evening, Meade eagerly sought the advice of his most trusted officers during a "Council of War" at his headquarters. To a man, the officers encouraged him to stay and fight the battle out to a final conclusion. The last day of the battle may have been Meade's finest hour when an aggressive Union defense thwarted the last Confederate hopes for victory. 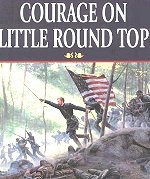 Beginning on July 5, Meade ordered his exhausted army southward in pursuit of Lee's army, which was in retreat back to Virginia. Despite the possible entrapment of Lee near the Potomac River, no further significant fighting occurred and Lee's Confederates escaped back into Virginia. Despite the decisive results of the campaign, Meade was criticized for the caution he exercised in following Lee's retreat back to Virginia. 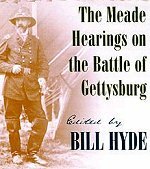 Some controversial commanders accused Meade of wishing to retreat from the field of Gettysburg, a charge totally unfounded, while others said he was too cautious in following Lee to the Potomac. 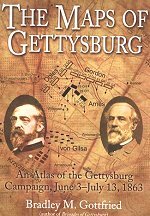 Yet the controversy did not diminish the significance of the victory at Gettysburg and President Lincoln expressed the gratitude of the nation for the victory. That fall, Meade led the Army of the Potomac through an endless, meandering series of skirmishes, later called the Mine Run Campaign, trying to outflank Lee's position in north central Virginia. Despite the best efforts of corps commanders and their commands, Meade was unable too get around Lee or bring him to a major battle. 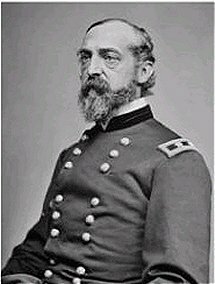 The army went into winter quarters along the Rapidan River and on January 28, 1864, General Meade received the official thanks of congress for his service in defeating Lee's Army of Northern Virginia at Gettysburg. General Ulysses S. Grant was appointed commander of all Union forces that same winter and he decided to accompany the Army of the Potomac in the opening of the spring campaign. As the Wilderness Campaign ground on, Meade's control of the army was curtailed by the presence and directions of his superior officer. 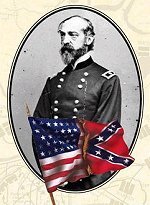 Never the less, he worked diligently in carrying out General Grant's orders and directives, moving the army where Grant desired and issuing the orders Grant gave. For his services Meade was promoted to major general in the regular army in August 1864. Meade's promotion came while the army was embroiled in the siege of Petersburg and Richmond, which lasted through the fall of 1864 until April 1865 when Lee ordered the defenses abandoned and his army to retreat to Danville. By Grant's directive, Meade set his army in motion to corral the Confederate forces, aided by General E.O.C. Ord's Army of the James . Despite nausea and a high fever, Meade insisted that he continue to command the army in what was to be the final campaign and accompanied his troops in an army ambulance. On April 9, 1865, Meade's headquarters were established several miles outside of Appomattox Court House near those of General Grant. That afternoon, while Grant and his staff rode to the court house, Meade once again took to his ambulance with a headache and fever. When the news of Lee's surrender arrived, Meade was uncharacteristically elated. Despite his illness, Meade rode his favorite horse "Baldy" up to the front to announce the surrender to the troops. After the close of the war, General Meade was placed in command of military districts on the east coast. He lived with his wife and family in Philadelphia until October 31, 1872 when he was struck down by a violent pain in his side. His old wound from the Battle of Glendale had reactivated internal problems and pneumonia set in. Meade rapidly faded and died on November 7, 1872. The general is buried in Laurel Hill Cemetery in Philadelphia. 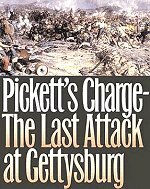 Pickett's July 3, 1863 charge up Cemetery Ridge is the climactic event of the Battle of Gettysburg and the defining moment of the Civil War. Known as the hero of Little Round Top and the commanding officer who accepted the Confederates' surrender at Appomattox. 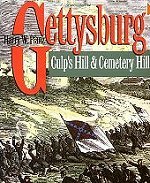 In this companion to his celebrated earlier book, Gettysburg: The Second Day, Pfanz provides the first definitive account of the fighting between the Army of the Potomac and Robert E. Lee's Army of Northern Virginia at Cemetery Hill and Culp's Hill--two of the most critical engagements fought at Gettysburg. 15 maps. 76 illus. Robert Wicker of the Fifteenth Alabama Regiment is promoted to Second Lieutentant after his predecessor was killed in action. Robert's regiment along with the rest of Robert E. Lee's Army of Northern Virginia are now on northern soil. 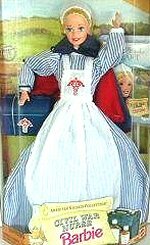 Part of the American Stories Collection.